David Wickerham Performance - Go Foxburg! 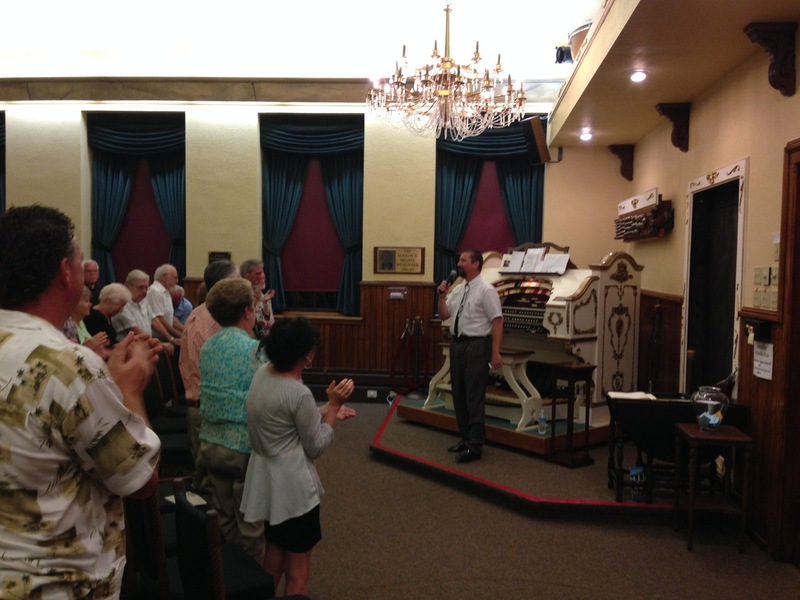 Allegheny RiverStone Center for the Arts was proud to present David Wickerham in a performance on Friday, September 5 at Lincoln Hall, Foxburg, PA, sponsored by Paul McKissick, who restored and brought the McKissick Mighty Wurlitzer Theatre Organ to Lincoln Hall. The concert was an 80th birthday celebration for Paul’s wife, Sally, and Dr. Arthur Steffee, founder of ARCA and benefactor of Foxburg. As of Thursday, September 4, the concert was SOLD OUT, with a waiting list for tickets, with more than 130 people in attendance. Lincoln Hall was filled with lovers of theatre organ music, Paul McKissicks’s treasured McKissick Mighty Wurlitzer, and the artistry of David Wickerham. Acclaimed as one of the greatest theatre organists of his generation, David Wickerham dazzled and mesmerized the audience with his superb arrangements of the theatre organ repertoire and his incredible improvisational skills. 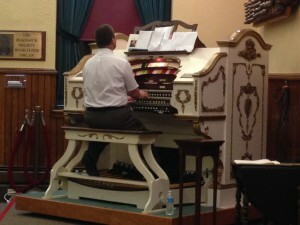 He took a request list from audiences during intermission and then wove them together into an uninterrupted tapestry of tunes for the duration of the program. David took several special requests on the first half including Bali Hai from South Pacific from Paul McKissick. The daughter of ARCA members, Jan and Barney Knorr, who is in the United States Armed Forces, had been married at a distance during the previous week; Dave played a wedding medley to celebrate their marriage. Three pages of requests from the audience were delightfully and eloquently woven together to entertain the amazed audience. Dave concluded the program with a stirring Happy Birthday medley tribute – with the audience joining in singing – to Dr. Arthur Steffee and Sally McKissick’s to celebrate their 80th Birthdays.